Located at 18 Military Street in Houlton, Maine, the Houlton Higher Education Center has worked for more than a decade to provide students with the very best in educational experiences and services. From college preparation, to Associate’s and Bachelor’s degrees, to refresher courses and lifelong learning activities, the University of Maine at Presque Isle facility brings a wide variety of educational programs under one roof. 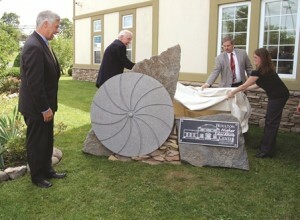 The vision for the Houlton Higher Education Center first took shape in 1999 as the result of a grassroots community effort to re-establish a formal home for higher education in the southern Aroostook area. At the time, UMPI maintained a modest education center in Houlton, and then-Northern Maine Technical College also had a presence there, but the Houlton community was looking to fill a larger void left after Ricker College closed in 1979. The community group worked collaboratively with the University of Maine System, the then-Maine Technical College System, and other educational entities to bring the Center to fruition. The idea was to transform a 15,500-square-foot building, formerly a Shop ‘n Save grocery store, into a one-of-a-kind educational facility. When approached by the University of Maine System, Hannaford Brothers graciously agreed to donate the Military Street building to the University. In order to pay for the $2 million renovation, officials received strong support from County legislators, and critical leadership from then Maine State Senator Michael Michaud in securing state funding for the Center. The project was completed ahead of schedule and under budget, and in Fall 2001, the Center welcomed its first students. Since then, the Center has reached many milestones, but one thing remains the same: everyone at the Houlton Higher Education Center works diligently to provide students with the very best in educational experiences, services and opportunities.